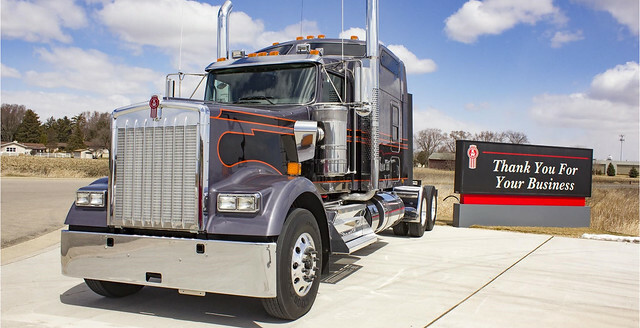 Kenworth W900 | CSM Companies, Inc. When you drive a Kenworth W900, you own the immediate vicinity. It is a look. It is a sound. It is the undeniable recognition of your achievement. After all, who could ignore the sheer presence of Kenworth’s W900L – with 130 inches from bumper to back-of-cab, one of the longest of long-nosed conventionals. Or miss the personalized message so clearly reflected in customized brightwork, hand-stitched upholstery and soul-stirring dual chromed stacks. Who wouldn’t gaze with envy at a hand-masked, hand-finished paint job that exhibits a luster so deep you can see it for miles. Or fail to appreciate the exclusive styling of a Kenworth AeroCab® or Studio Sleeper. A W900 blends the choices you make, from powertrain to paint scheme, with Kenworth’s right-the-first-time manufacturing integrity. The result is the best engineered, hardest-working, most luxuriously comfortable, downright aweinspiring truck we know how to build. Kenworth W900. No matter where it goes, it won’t go unnoticed.